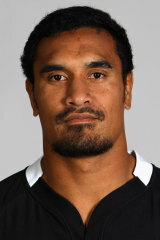 A versatile back-row forward with a strong running game, Kaino is currently a key member of the All Blacks squad and was part of the side that lifted the Rugby World Cup on home soil in 2011. Blessed with pace and athleticism, he began his career as a back but later made his home in the forwards while plying his trade with Auckland and the Blues. The International Rugby Board U21 Player of the Year in 2004, he made his Test debut two years later as a replacement against Ireland in Hamilton. He was handed a starting spot the following week against the same opposition but failed to impress with many in the media believing Kaino was out of his depth. As a result he disappeared into the international rugby wilderness for a couple of years before earning a recall for the internationals against England and Ireland as well as the Tri-Nations. He retained his place in the squad for the tour of the UK at the end of the year and has been a near-constant presence in the All Blacks back row ever since. Kaino played all but 55 seconds of the All Blacks' World Cup campaign, holding off the challenge of Adam Thomson for the No.6 jersey and capped a stellar year with the Kelvin R Tremain Memorial award as New Zealand's Player of the Year.